NIU honors program nursing students Jordan Reich, Logan Turner, Rachel Shapland and Lauren Greene. 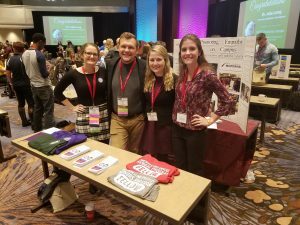 NIU University Honors nursing students Rachel Shapland and Lauren Greene recently presented: “Student-run leadership and student engagement: Serving on an honors council,” at the 52nd annual National Collegiate Honors Council, held in Atlanta recently. Specifically, in collaboration with Jordan Reich and Logan Turner (honors students from Northwestern State University in Louisiana), the session explored ways to better engage honors students. The conference highlighted student and faculty research presentations from across the nation, and provided training and development for honors program administrators. The conference theme, “Just Honors,” explored how the honors faculty and students can address the issues of access, equity, and technology as key partners in the community. Bryan Stevenson, executive director of the Equal Justice Initiative, and author of “Just Mercy,” provided the keynote address. This year, over 2,000 students and faculty for all 50 states as well as Australia, China, Great Britain, the Netherlands and Qatar attended the NCHS conference. The National Collegiate Honors Council is a non-profit organization whose mission is to support and enhance the community of educational institutions, professionals and students who participate in collegiate honors education around the world and is comprised of nearly 900 member institutions from the United States and around the world.